Question: Good day! Me and my wife are planning a little fishing trip around your end. No charter fishing - just piers, beaches and spots. 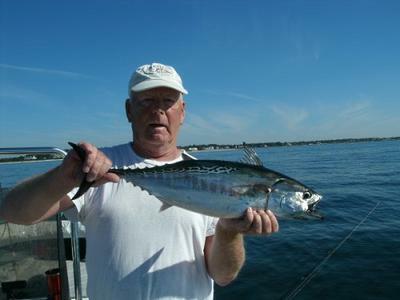 Is September and October a good time of the year for fishing in Cape Cod? We are from Canada and can't wait to try fishing in your region! Dee's Reply: Oh my goodness, Steve ... it's not just a good time of year to go fishing on Cape Cod - it's a great time! In fact, if I had to choose just one month out of the whole year to fish here, it'd be September. To give you an idea of what's feeding in our local waters now (the first week of September), there's Bluefish, Striped Bass, False Albacore, Spanish Mackerel, Black Sea Bass, and Scup - all of which can be caught from a pier, jetty or shore if you're in the right place at the right time. The photo I've included at the top of this page is my hubby with one of the False Albacore we caught yesterday. The "Albies" were busting a bait school near the beach in Centerville. Tons of fun on light tackle!! Black Sea Bass season closes in mid-September 2014. The other species I mentioned above will hopefully stick around through the end of September at least. In late September and early October, big Striped Bass and Bluefish come to our shores to "put on the feed bag" and bulk up for their migration south for the winter. If you're coming to Cape Cod in October, bring your surf rods and get ready for some memorable days casting and catching from the beach! Want a little fun reading to get you jazzed up for your fishing trip? Have a look at On The Water's website. (It's one of my favorite resources for local fishing reports.) Scroll through the older reports and check out the ones from September and October in prior years. That'll give you a good idea of what Cape Cod fishing is like in late summer and early autumn. In a word: Fantastic! I hope this info helps. If you have other questions, please feel free to ask! P.S. Friendly reminder: You'll need a MA fishing permit. Here's my page about Massachusetts fishing licenses and permits.